Amid the pomp and circumstance of tablets and hybrid netbooks from CES 2010, there's a few notable introductions that slipped under the radar. The HP Mini 5102 -- backed by a SUSE Linux option -- is one of those devices. Coming soon from HP, the Mini 5102 is shipping with some interesting features. Here's the deal. Amid the pomp and circumstance of tablets and hybrid netbooks from CES 2010, there’s a few notable introductions that slipped under the radar. The HP Mini 5102 — backed by a SUSE Linux option — is one of those devices. Coming soon from HP, the Mini 5102 is shipping with some interesting features. Here’s the deal. It’s also sporting 3G capabilities, and according to HP’s site, you can get service from Verizon, Sprint or AT&T. GPS is built in, as well. HP is also offering it with an 80GB Solid State Drive, but you can get up to 320GB on a SATA drive if you’re feeling thrifty. The interesting news is that HP is shipping it with the option for Windows 7 Starter, XP, FreeDOS and SUSE Linux Enterprise 11. Anytime Linux gets proliferated in the work environment, it’s intriguing — especially since initial reaction to Windows 7 has been so positive. VARs might want to get in on this, too, if you’re working a partner program with HP. SUSE Linux Enterprise 11 is coming from Novell, so you know you’re getting solid support and stability. HP has had a longstanding partnership with Novell, so that could give VARs extra confidence. The only Linux that works seamlessly with Windows servers and desktops…and only SUSE Linux Enterprise powers your physical and virtual infrastructure, from x86 to mainframe and from netbook to desktop, with the most certified Linux applications. We call this ubiquity….SUSE Linux Enterprise Desktop delivers…maximum interoperability with Microsoft Office and Exchange, [and will] help you reduce costs and increase productivity. If you’re bored with brown-old Ubuntu, I recommend taking a look at SUSE Linux and embrace the green iguana. It seems like a good plan with HP as the backbone. Who says Ubuntu has to be brown? I have an early 9inch HP mini upon which I installed openSuse 11.1 which I took all round africa in 2008. Brilliant. This looks very tasty, I hoppe it comes to the UK at a sensible price. I’m sick of pre-loaded *nix costing more than microsoft. This, and the newly MSI Wind U135 might persuade me into buying a netbook. I only want a linux netbook because I don’t want to buy a windows version and dual boot it or put a linux version on it myself. So if these two companies decide to seel their linux version, I’m sold. Netbooks are sort of neat. And I have tested some HP’s and Acer’s with openSUSE. They work well. In many tests they are about the equivalent of an old Pentium-M at about 1.4Ghz.. which isn’t bad. Screen real estate can be frustrating, but I did do tests accessing my work desktop via NX… and had NO problems. If you’ve got the bucks, and like the small form factor, I recommend the HP Elitebook 2530p. 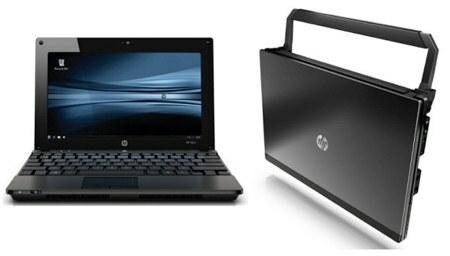 It measure 8.5″ x 11″ (slightly larger than netbook), has a higher res screen, a full Core 2 Duo, 8G memory, webcam and SSD options and still has a built-in DVD/CDRW (and has WLAN as well). Yes.. it costs 2-4x the cost of a netbook, but you can run 5+ virtual machines simultaneously on it and it has the CPU horsepower to play 1080p even with the meager Intel 4500MHD based GPU. That’s what own and use… using openSUSE 11.1 currently. I’d love to have this. Do you know if it’s coming to Canada? I don’t like Ubuntu, but SuSE is DEFINITELY the worst of the big linux distros. I would even take RedHat over it. SuSE is the hardest to manage, their graphical utilities leave a lot to be desired, and their package management system is an absolute nightmare. Is it coming to Australia anytime soon … or ever at all? Anyways, point being, if desktop is your concern in choosing a linux distro, go KDE! I slightly tilt towards Ubuntu (KDE doesnt bother you much with the silly eyecandy mumbo jumbo 🙂 ) for its awesome package mgmt features. Whilst the HP Mini 5102 (VQ670EA) comes pre-installed with SUSE Linux Enterprise Desktop (SLED) it isn’t optimised for the netbook and doesn’t provide much choice regarding applications and multimedia support. Consequently I ditched this in favour of the latest Ubuntu﻿ release. Ubuntu 10.04 works out of the box on this netbook. See http://martinwebster.info/2010/05/01/ubuntu-hp-5102/ for installation details.